Public inquiries have been quite popular activities over the last few decades: Brixton riots, Bloody Sunday, Hillsborough, Shipman, Soham, Leveson, Mid-Staffordshire hospital and currently the troubled Saville inquiry. Some of these like Shipman may have resulted in systemic changes to public service organisations with some merit, others seem to have been primarily for reasons of catharsis. 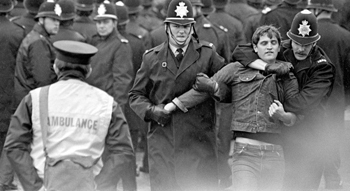 The summer of 2014 saw class warrior Ed Milibland call for a Public Inquiry into the Battle for Orgreave during the 1984's miners strike, which has just been formally rejected by Home Secretary Amber Rudd. Why the fuss after more than 30 years? Events at the Yorkshire coking plant, Orgreave, in June 1984 were certainly some of the clearest demonstrations of government led class war, focussed on the miners during their national strike against pit closures. The allegations of police brutality and more than bending the rules are blatanty obvious to anyone with a grounding on planet connected. The unhealthy obsession with demanding an official inquiry into every aspect of Britain’s past seized on Orgreave recently when in November 2012, the South Yorkshire police force even referred itself to the Independent Police Complaints Commission (IPCC) over allegations of assault, perjury and perverting the course of justice by officers at Orgreave and in the subsequent court cases. The fact that posh boy Milibland supported South Yorkshire police's campaign suggests that such an inquiry would be worse than useless. And the Corbyn opposition have seized on the government announcement to try and develop a sense of purpose to a political elite profoundly disconnected to the electorate. Posing as radical and on the side of miners as hard done by victims so long after the strike of 1984-5 confirms that the old class war is long over – and that, having been defeated and de-clawed, workers such as the miners can now safely be patronised as powerless and in need of recognition. It's the desperation of middle-class politicians to present themselves as relevant that is played out here though. The Battle of Orgreave was a brutal and bitter clash between thousands of striking miners and an army of riot police outside a Yorkshire coke works on 18 June 1984, which left scores injured and led to 95 miners being charged with riot (the trial collapsed amid revelations of a police and prosecution frame-up). Back in 2014 then Labour leader Milibland sought to establish some workerist credentials by joining the calls for an inquiry, and praised the miners’ strike as a fight ‘for justice, for your community, for equality, for all the things that mattered. The values you fought for are the values that we have to take forward for the future.’ The values? They were fighting for their jobs, a fight that wasn't supported at the time by Labour leader Neil Kinnock. The day after the Battle of Orgreave, Tory prime minister Margaret Thatcher stood up in the House of Commons to support the police and blame the striking miners for what had happened, condemning the mass picket of the coking works as ‘mob rule and intimidation’. She declared that ‘giving into mob rule would be the end of liberty and democracy’, and challenged Labour opposition leader Neil Kinnock ‘forthrightly and unequivocally to condemn the scenes outside Orgreave works yesterday’. In response, Kinnock could only offer the pathetic plea that he had ‘repeatedly condemned without reservation violence by any and all parties in industrial disputes’. Asking why everybody couldn’t just get along and play by the rules isn't what the miners needed then, and only of interest to an army of lawyers now. What the thousands of striking miners thought of the Labour leadership’s attitude became abundantly clear in November 1984, when TUC general secretary Norman Willis addressed a miners’ rally in South Wales. The union leader made a speech attacking miners who fought back against the police. ‘Violence creates more violence’, said Willis. ‘Such acts if they are done by miners are alien to our common trade-union tradition.’ As Willis’s Thatcher-lite tirade against picket-line violence continued, a group of Welsh miners showed their appreciation by lowering a noose in front of him. Shadow home secretary Diane Abbott described the decision as a "grave injustice", while Andy Burnham MP called it an "establishment stitch-up". It was an establishment stitch-up that Labour colluded in at the time so disingenuous at best to campaign around it now, and more like today's middle-class politicians feeding off the way the miners were clearly attacked by a brutal and organised police force whilst being sold out by the Labour leadership of the time. The miners attacked by the police at Orgreave were not just hapless victims though, despite such presentation today. They went to try to close down the coking works, in the certain knowledge that there would be a confrontation with the police as there had been on every other picket line since the strike started three months earlier. The cause they were fighting for was the survival of their jobs and communities – their livelihoods and entire way of life were at stake. The real stitch-up worth exposing is the miners' leaders, along with the Labour leaders they funded, who asked them not to be organised to fight a class war but to moderate their actions within official channels. The BBC news infamously edited its film of Orgreave to make it appear that the miners charged the police lines first, rather than waiting to be attacked. Now the miners are defeated, the BBC feel they too can become champions of the victims cause by posing as champion of the downtrodden and forgotten. Not everyone forgets the role the BBC played during that strike so freely though and don't buy the faux and patronising concern. Orgreave became the last great battle of the miners’ strike, and of the wider class war between the state and the organised labour movement. That traditional trade-union movement was already weakened by splits and bureaucratic leadership; indeed, the miners were only picketing the coking works because the steelworkers’ union and others had failed to support their strike, using as their excuse the split in the National Union of Mineworkers (NUM) and the refusal of NUM leader Arthur Scargill to hold a national ballot. After Orgreave, the miners held out for another nine months, though there was little chance of anything but defeat. The Battle of Orgreave and the miners’ strike do still matter, but they shouldn’t be used to stage a mock-up rematch between the ghosts of class struggles past. The end of that era of class struggle brought on the end of the politics of left and right, which has shaped the (lack of) response to the cuts and redundancies of the latest recession. What we need now is not another inquiry. It would be better to rekindle their fighting spirit, for the very different battles that need to be fought today. The old class struggle may not be evident now, the working class having been defeated as an organised force and removed from the political stage. The anti-working class, anti-popular factor in the elite’s new assaults on everything from free speech to Brexit voters should alert us to the fact that the Battle for the Future won't be won by sanitising the past. Thirty years ago, the state was fighting an open class war. Now the enfeebled authorities are using more subtle ways to try to nudge the public into submission. But the principle of opposing state interference to defend our liberties remains the same. Yet still the rump of the left clings to the state’s coat-tails, calling for judges and lords and quangos to fight their old battles, having learnt nothing from the bitter defeats of the past. No arm of the state should be trusted to preserve our freedoms – nor should the left hand be asked to inquire into what the right hand did 30 years ago.